[0:01] <TomWij> Toothpick: No, you'll want to pass along a lot more to that configure line (type ./configure --help for a full list). And if you want the music / sound in the GUI you will want to enable alsa and pulse. [0:03] <Toothpick> TomWij: oh... can i extract the same configure line as the one portage uses if i had emerged it using portage? [0:03] <TomWij> Toothpick: Yes, you can adapt that one. [0:04] <Toothpick> TomWij: how is that possible? [0:08] <TomWij> Toothpick: Add the options that are missing and change the lines that you need to change? [0:09] <TomWij> For instance, the Portage ebuild doesn't have a RPi target. [0:10] <gordonDrogon> waterproofing is overrated. [0:10] <Toothpick> TomWij: yea but how do i translate use flags into configure options ? [0:10] <gordonDrogon> if the cables come out the bottom in a properly sized grommet then as long as you keep it turned on - to keep it warm, you shouldn't have any issues with moisture. [0:10] <TomWij> So the few I gave should set you up for a good start. And passing the flags should make it proceed through the "missing library". [0:11] <TomWij> Toothpick: Well, you either set the USE flag on your system or you replace the $(use_enable something) by --disable-something or --enable-something. [0:11] <TomWij> The bonus of doing it in your custom ebuild is that you can't break it when you recompile it later and have changed the system USE flags. [0:16] <TomWij> markedathome: unmute and set it at a volume in alsamixer (or amixer)? [0:16] <TomWij> The only thing I can come up with is that aplay unmutes it, plays the file and mutes it again; but well, I don't know whether aplay would do that. [0:17] <Toothpick> TomWij: so do you say that the USE flags i set in /etc/portage/package.use will apply to the ./configure process ? [0:18] <TomWij> markedathome: Hmm, what kind of playback device are you using? [0:19] <TomWij> "use_enable test" transforms into --enable-test if USE="test" is set and --disable-test if USE="-test". [0:20] <TomWij> "use_enable test test2" allows you to do --enable-test2 for USE="test"
[0:20] <Toothpick> TomWij: btw it says "bash: econf: command not found"
[0:21] <TomWij> markedathome: I'd think the headphones turn off/on based on whether there is audio playing or not, have you tried different ones? [0:23] <Toothpick> TomWij: now i get it, so can i edit the ebuild and then emerge it ? [0:24] <TomWij> You can try to do manual things on the temporary directory to see how you would need to change the ebuild, then either start over or let it continue. [0:24] <TomWij> And eventually you'll have an ebuild capable of doing the whole thing (or a large part of it). [0:25] <martk100> Has anyone managed to get xbmc on the pi working wiith a touchscreen? [0:26] <dr_willis> martk100: :) not heard anyone in here mention that.. would be neat..
[0:26] <TomWij> martk100: Makes me wonder if it has touchscreen support. [0:26] * rikkib 31.6 deg C inside. 36 deg C outside on the window in direct sunlight. [0:26] * rikkib shirt off. [0:27] <TomWij> rikkib: Nice, you're having summer while I'm having winter. [0:28] <TomWij> Phrewfuf: Watch out with that, I'm in rainy Belgium. [0:29] <martk100> OK thanks all. I will have to hope someone does it eventually. [0:29] <gordonDrogon> not video output touchscreens though. [0:30] <gordonDrogon> Phrewfuf, are they? it looks like a screen to me - it displays moving images behind the touchpad..
[0:30] <Phrewfuf> gordonDrogon: huh? not video touchscreens with video`? [0:31] <gordonDrogon> well they can ply video, just not the Pi's video output. [0:31] <gordonDrogon> video on a local SD card. [0:31] <martk100> gordomDrogon: My touchscreen works , just about. But not in xbmc. [0:33] <Phrewfuf> gordonDrogon: where to get thos neat displays? [0:35] <gordonDrogon> Phrewfuf, right now, directly off 4D in Austrailia, but they sell via the "usual" places - e.g. skpang in the UK. [0:36] <martk100> Phrewfuf: The screen and touychscreen . controler etc can be purchased fro Chalkboard Electronics . [0:36] <Phrewfuf> so...you used the serial lconnection for touch? [0:36] <martk100> Phrewfuf:Mine is usb. [0:37] <gordonDrogon> the 4d ones are serial. [0:37] <gordonDrogon> megaproxy, does it need cooling? [0:37] <gordonDrogon> techkid6_, what do you have in /etc/apt/sources.list? [0:38] <TAFB_ssd> techkid6: try the torrent link, their website kept downloading corrupt images for me. [0:38] <gordonDrogon> 50C is OK.
[0:38] <martk100> Phrewfuf:Screen is hdmi touchscren is usb. [0:38] <techkid6_> gordonDrogon: Yes, is there any other download besides the torrent? [0:38] <Phrewfuf> martk100: is that a lilipu screen that you have there? [0:39] <megaproxy> what other ways? [0:39] <megaproxy> and i have some dust filters for pc cases. [0:39] <martk100> Phrewfuf: No a high res (1280x800) 10inch display. [0:41] <martk100> Maybe.Not cheep but it all works.But needs lots of development. [0:43] <martk100> Phrewfuf: This touchscreen is capacative with theoretical multitouch capability. [0:44] <martk100> Phrewfuf: I may to wait untill Android becomes available to make much progress. [0:46] <martk100> Phrewfuf: My screen controler plugs int the hdmi socket. [0:46] <TomWij> techkid6_: You can use JVM on hardfloat, there's a preview for that. [0:52] <TomWij> Only reason I have Java on my RPi, and I might look into what it's actually needed for and whether it can be removed. [0:53] <davzie> Phrewfuf: Any recommendations? [0:54] <techkid6_> Ok, does Raspbian work alright o a 16GB Class 4? [0:54] <TomWij> 4GB Class 4 here too ordered along from RS, getting a larger Class 10 before I run out of space and since the performance is at least double as good. [0:55] <TomWij> Should've just bought the Class 10 straight away, but I was like "want to be able to use it straight away once I receive it" so it still fits well as a back-up testing SD card which is "known to work with it". [0:57] <techkid6_> and one last q, does the Pi start up with SSH enabled? Or will I have to enable it myself? [0:57] <Phrewfuf> techkid6_: what distro? [1:08] <plugwash> Hexxeh, btw do you have any ideas why my updated chromium packages may be failing with an illegal instruction error? [1:08] <Hexxeh> got a trace? [1:10] <plugwash> and then bring the coredump over to the imx board and try and run gdb on it there? [1:18] <TomWij> markedathome: No different headphones to try? [1:19] <TomWij> I do have snd-bcm2835 for modprobing as well, I assume that doesn't matter. [1:21] <markedathome> tried different headphones, and a speaker set, all three have same start and end. [1:27] * dr_willis puts some ice cream and a cherry on top of techkid6 's pi. [1:27] <dr_willis> Now its finished! [1:34] <Phrewfuf> how could you?! [1:34] <Hexxeh> any spotify fans who used to use despotify here? [1:46] <Hopsy> I have installed wifi! [1:49] <hnsr> doesn't quake3 run pretty well on the rpi? [1:50] <techkid6> Would tightvncserver work for the pi? [2:16] <plugwash> what sort of phone is it? [2:18] <plugwash> do you know how it presents itself to the PC? [2:19] <bennypr0fane> what's that line say? [2:22] <bennypr0fane> plugwash ha, I knew there had to be a way to configure devices. But isn't there a GUI util installed? [2:22] <bennypr0fane> so same as your phone, right? [2:26] <bennypr0fane> what about that line in /etc/network/interfaces: "allow hotplug wlan0" wouldn't it make sense to add one for the usb0 as well? [2:27] <bennypr0fane> you use not Raspbian? [2:27] <bennypr0fane> Or only /wo GUI? [2:31] <plugwash> so why did you do it? [2:31] <TAFB_ssd> i like raspberryapi.com :) it's good. [2:31] <du> thanks, TAFB_ssd. plugwash, to develop it. [2:31] <plugwash> develop it into what? [2:33] <bennypr0fane> whcih program manages the internet connection? [2:34] <plugwash> sorry "ifup usb0"
[2:36] <bennypr0fane> woohoo, I got internet! [2:37] <bennypr0fane> ifup said "usb interface already configured"
[2:38] <bennypr0fane> plugwash do I need this command to start the connection for each session? [2:38] <Gorroth> what is that? python? [2:39] <MAssEy> anyone else getting hash sum mismatch on apt-get update? [2:39] <bennypr0fane> plugwash hmmm, I added "allow hotplug usb0". Where would I have to insert auto usb0? just at the end of the file? [2:57] <techkid6> Hey, dumb question, I generated a keypair to use with my raspberry pi, where do I put the public key, just in etc/ssh? [2:59] <confuzled> you said rename the dir as well? [2:59] <dr_willis> sraue: so even after getting the latest. change that file? [3:04] <TAFB_ssd> what's so spiffy about openelec? [3:04] <dr_willis> but the details of the internal stuff.. is most likely beyond me,. [3:06] <dr_willis> Well.. the opelenec download just went from 5 min.. to 50min.. whos hammering the servers! :) wait till im done. [3:07] <techkid6> So, for the SSH public key, do I just put it in /etc/ssh? [3:08] <Hexxeh> aren't the xbmc folks constantly getting ddosed etc? [3:10] <confuzled> what is openelec default password? [3:11] <sraue> why not updating? [3:17] <techkid6> So then, would I copy the id_rsa.pub and uncomment the line in the config? [3:22] <dr_willis> so what were we testing? Oh a theme.. quartz? [3:34] <bsd1101> so you converted ? [3:35] <bsd1101> but you still converted ? [3:36] <bennypr0fane> what other tools can I use to set the res? [3:36] <bsd1101> are you on raspbian ? [3:37] <bsd1101> tech, raspbian ? [3:37] <bsd1101> and are you logging in through ssh or regular ? [3:39] <TechDesk> which browser is available on archlinux ? [3:40] <bsd1101> techkid, did you follow the instructions in generating the key the first time you installed the OS ? [3:41] <bsd1101> what distro are you running on ur pi ? [3:43] <markbook> err... look at the current contents? [4:31] <Aranel> anybody set-up a music server on their pi? [4:41] <UnaClocker> Aranel: What kind of "music server"? I've run Pianobar on mine to stream Pandora..
[4:41] <mdszy> has anyone had some weird issue with debconf and trying to update Raspbian? [4:43] <UnaClocker> I've been doing Airplay with RaspBMC for months. [4:46] <UnaClocker> Even android phones can do airplay. [4:47] <UnaClocker> Nope, it's usually video. [4:47] <UnaClocker> Best way to play YouTube on a Pi..
[4:47] <dr_willis> Might have to look into it then. [4:50] <UnaClocker> Never heard of grooveshark, but that's cool. [4:56] <mdszy> meh, maybe I'll give Arch Linux ARM a shot. [4:58] <mdszy> Does anyone know if Arch linux ARM has ssh login enabled by default like Raspbian does? [4:59] <TechDesk> with which video driver i can have better performances on archlinux ? [5:32] <dr_willis> Hmm. theres getting to be a lot of little mini android type pcs out. :) was picking up some pi parts on amazon and saw a dozen of the things. [5:33] <Hodapp> dr_willis: I have an MK802. Neat little device, cheap little device, faster-than-a-RasPi, runs Android okay... but I'd say the Pi blows it out of the water for build quality and for good Linux support. [5:34] <dr_willis> saw a few that do xbmc. but then say they are android.. so xbmc has been ported to android? [5:34] <dr_willis> or was it just sort of marketing confusion. [5:34] <Hodapp> dr_willis: I do believe so. Whether or not this means they'll run the XBMC port of Android is another matter completely. [5:35] <Hodapp> akiwiguy: "not hard" and "been done" are two different categories though. [5:35] <KeatonT> I've always wondered what xmbc's primary language was. [5:35] <akiwiguy> there is afaik an xbmc port for android already. [5:36] <Hodapp> akiwiguy, dr_willis: The MK802 devices are quite cheap and do Android somewhat well. [5:36] <dr_willis> i saw one on amazon for $35 i think. but i figured ill wait a bit. [5:36] <Hodapp> however there is a newer one - 805 maybe? - that is supposedly a better buy. [5:36] <dr_willis> saw a $100 one that did xbmc, and had a spot for a internal hard drive.. that would be about what the wife needs. [5:37] <Hodapp> I did play Youtube just fine on it. [5:39] <dr_willis> Full XBMC Hardware Decoding Support for 1080p High Definition Playback! [5:39] <dr_willis> the use of the term.. 'Full xbmc' seems... weird..
[5:40] <Hodapp> the MK802 is "supposed" to be able to do 2160p. [5:40] <dr_willis> Fully Hackable - System comes Pre-Rooted and ready for anything you can think of! [5:43] <dr_willis> Hmm. with one running actual Android.. it could use the netflix android app.. that would be a bonus for the wife. [5:43] <dr_willis> Looking to replace her very old O!-Play player. [5:43] <Hodapp> mine will not run the Netflix app. I don't know why. It quits immediately. [5:44] <Hodapp> be aware of this. [5:46] <Hodapp> dr_willis: this was long after Netflix had the device check, I'm fairly sure. [5:46] <dr_willis> Netflix would be a nice bonus. but i imagine her next tv will ahve it built in. [5:47] <dr_willis> almost every tv in the house has netflix built in now. [5:49] <dr_willis> my 'main' thing i want is 'crunchyroll' since it seems that with my BoxeeBox - the crunchyroll app/channel is now dead. [5:49] <dr_willis> But the boxee so far can still do netflix. [5:50] <Torikun> any news on minecraft? [5:51] <UnaClocker> Yeah, it got delayed because of GCC issues. [5:52] <Torikun> usnt therr a browser version? [5:52] <Torikun> maybe it work over vnc with chromne? [6:19] <dr_willis> Hmm. weechat seems to run ok here. but im not in tmux with it. [6:32] <Torikun> tethered to cell phone for net? [6:33] <dr_willis> its not as cool. [6:33] <dr_willis> I can have Pie In my Pi! if i build it into my Lunchbox. [6:35] <dr_willis> a HUD with USB powered Missle Launchers! [8:13] <SpeedEvil> everyone is at the foam party. [8:16] <shiftplusone> I've seen a few people saying their lapdock keyboard doesn't work, no idea why though. [8:16] <shiftplusone> maybe you'll find something in the "so i've made a raspberrypi laptop" thread on the forum. [8:18] <shiftplusone> I would imagine that the folks with the lapdocks would. I am yet to get the right usb adapter. Have had the lapdock for ages... to lazy. [8:19] <shiftplusone> any chance the switch has a resistance which causes a sufficient voltage drop and stop the keyboard from working? [8:21] <torgo> shiftplusone: how would I find that out? Do I need a multimeter or something? [8:34] <atouk> did you edit your sudoers? [8:37] <Nunnsy> Got it, will do that now. Is it possible to do that for the "pi" user aswell so sudo'ing isn't required? [8:40] <Pickley> is it preassembled? [8:44] <gordonDrogon> moring from rainy Devon. [8:46] <gordonDrogon> Pickley, hard to tell - http://www.bitwizard.nl/wiki/index.php/User_Interface has a blank section on assembly. [8:47] <gordonDrogon> Gene-, it's Debian, so apt-get, aptitude, dselect, dpkg, etc. are all there. [8:48] <Gene-> what's good for lightweight editing but has more formatting options than vim? [8:51] <gordonDrogon> I use vim & LaTeX ..
[8:53] <gordonDrogon> although if you have a 512MB model, then it might be ok.
[8:54] <Gene-> what do you recommend for replacing libreoffice with then? [8:54] <Gene-> abiword works fine? [8:56] <gordonDrogon> I don't know - I really don't use those tools myself. [8:57] <gordonDrogon> vim+latex is my 'word processor'. I run up Libreoffice very rarely when I need a spreadsheet. [8:58] <gordonDrogon> however 8am is breakfast time here. [8:58] <gordonDrogon> and my bacon won't cook itself! [9:42] <arnorhs> btw.. are you getting an error? [9:43] <gordonDrogon> Nunnsy, sorted? How are you calling the script? [9:45] <gordonDrogon> I'd do it the other way round - put the sudo command inside the shell script. [9:48] <gordonDrogon> the way I do it from php is to have a suid C wrapper program - similar to apaches - then be paraoind about making checks, etc. before running the program. [9:49] <gordonDrogon> but I have many public facing servers, so need/want to be as paranoid as possible just in-case someone hacks in - gives them less ammunition. [11:20] <gordonDrogon> Coburn, not easier to install adblock+ into your browser? [11:21] <Coburn> See the issue? [11:22] <str0be> Avahi was the biggets issue when setting up CUPs though. [11:29] <linuxstb> gordonDrogon: I thought CUPs pre-dated Apple, but was later incorporated into OS X and bought by Apple. 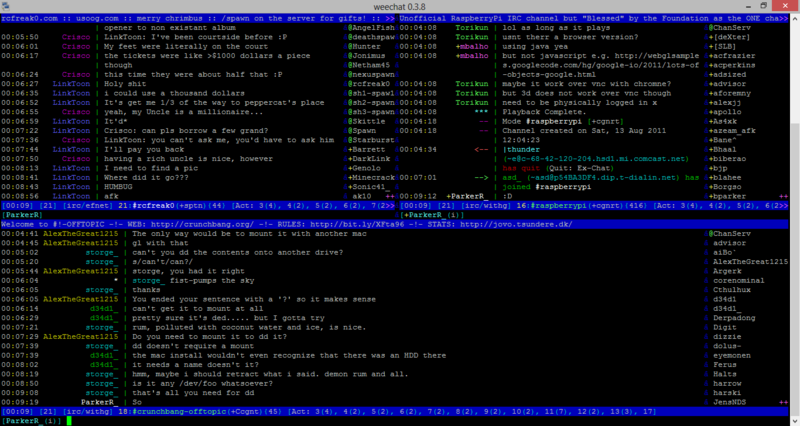 [11:34] <gordonDrogon> it goes against almost everything I liked about unix/linux though - it's large & bloated. Has it's own built-in web server, hooks into too many other libraries, etc. [11:34] <gordonDrogon> however I know I'm fighting a lowing batter - just throw another CPU and Gig of RAM at it and you'll be fine.. (etc). [11:34] <Coburn> what about android devices? [11:34] <martk100> When I attempt to use a touchscreen and virtual keyboard. I get constantly repeated keys because the mouse pointer is on the key. In my previous life in electrical control we used a peice of code called a one shot to prevent this sort of thing how do I "one shot" the virtual keyboard? [11:37] <gordonDrogon> I know, I hate it too. Really hard to get away from now. There are even some sites that will not work unless you enable cookies too. [11:37] <gordonDrogon> it's getting a chore to remember to clear cookies, etc. too. [11:37] <gordonDrogon> Even fscking google gave me a personalised google doodle on the day I told them my birthday was! [11:38] <Lobs> sounds better than the dog leaving a doodle in your bed! [11:39] <Aranel> anyone using Dynamic Memory Split (CMA)? 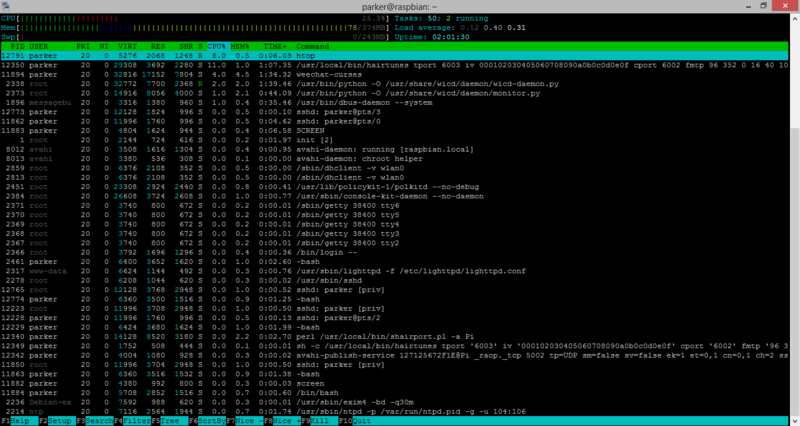 [11:44] * Aranel /usr/sbin/squeezeboxserver consuming a whopping %38.8 memory, yay. [12:09] <TechDesk> can you pastebin your fstab ? [12:10] <linuxstb> Is sftp even the same thing as sshfs? [12:11] <Lobs> linuxstb: they both use ssh in the same way to log in and transfer files. [12:14] <Lobs> there is a command line util to pastebin files, i forget its name now. [12:14] <Lobs> why would you use nano? vi is much better. [12:15] <linuxstb> Phrewfuf: Can you mount it manually? [12:19] <Lobs> Phrewfuf: are you sure the tutorial you were following didnt add the line to say rc.local to mount at boot time rather than fstab? [12:20] <Phrewfuf> Lobs: yup, pretty sure it said "add that line to fstab <insert what i posted before>"
[12:20] <Lobs> Phrewfuf: give the idiot who made that tutorial a kick in the nads then. [12:21] <gordonDrogon> why sshfs and not not nfs? [12:21] <Lobs> gordonDrogon: because it is fun to use all your cpu to transfer files! 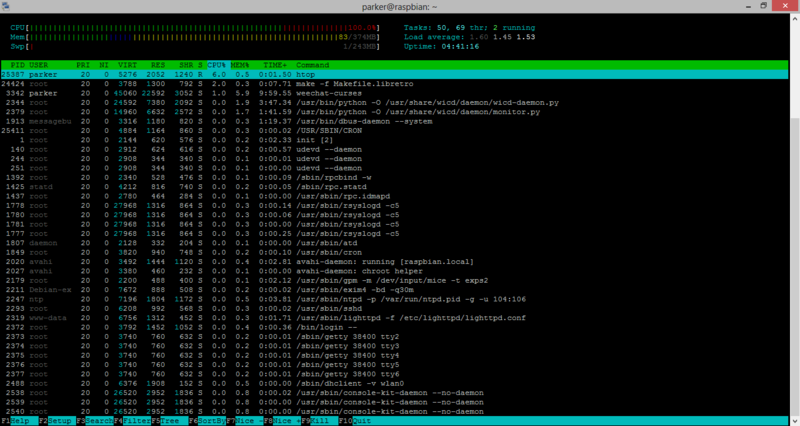 [12:22] <gordonDrogon> ssh is cpu heavy on the pi. [12:24] <Toothpick> it looks like i am going to run out of space on my RPi installing xbmc on Gentoo, is there an option to easily see what's taking so much space? [12:25] <linuxstb> Lobs: Sure, but again, that shouldn't be an issue unless you've built your own kernel. [12:26] <gordonDrogon> can you people actually read that screen with so many colours and low contrast? [12:27] <ParkerR_> gordonDrogon: Is that in reply to my image? [12:28] <gordonDrogon> no worse than the usual age related issues (ie. I need reading glasses). [12:28] <gordonDrogon> I'm not colour blind either - just dyslexic. [12:28] <gordonDrogon> I can read it, it just takes time. [12:30] <Lobs> do you really need to see every user all the time? [12:30] <Phrewfuf> hm, whz can/t i mount nfs? [12:31] <Lobs> ParkerR_: a waste of time in a console application if you ask me. 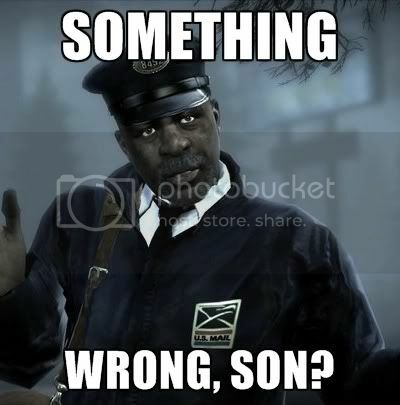 [12:32] <Lobs> Phrewfuf: have you configured the server properly? [12:33] <Lobs> ParkerR_: thats what /w is for. [12:33] <Lobs> mouse?!?!? who uses the mouse in a console app.... thats just wrong! [12:33] <Lobs> Phrewfuf: give up then, use sshfs and see if you can disable encryption if you dont need it. [12:35] <Lobs> poor japanese, prolly ran around for a few hours trying to work out what happend. [12:35] <Coburn> "HALP I'M DYING HERE OUT OF MEMORY"
[12:36] <Lobs> oh, so not "all your memory are belong to us!"? [12:37] <Coburn> "OMG! ITS A MOUNT!" [12:39] <Coburn> But hey, that's my story. [12:40] <Coburn> Phrewfuf: what dir? [12:41] <Coburn> Mounted as root? [12:41] <Coburn> Can't access as user? [12:42] <Coburn> also, why /mnt//shack? [12:51] <Coburn> 9:51PM. I need sleep. [12:52] <Coburn> Wanna make your R-Pi go super fast? [12:52] <Lobs> and OMG, 9:15PM and you need sleep!?!?!?! [12:52] <Coburn> I still get people who ask (genuinely) "what does it mean"
[12:52] <Coburn> I'm like "it decrapifies your PC"
[12:53] <Phrewfuf> Coburn: people still fall for that? [12:53] <Lobs> that a very bad joke to use, very dangerous when there are people who dont know what they are doing about. [12:59] <gordonDrogon> it will generally run to completion. [13:00] <gordonDrogon> files that are open will not be deleted from the filesystem until they are closed. [13:00] <gordonDrogon> this feature allows you to delete a program and replace it with a new one. [13:00] <gordonDrogon> same for libraries. [13:01] <gordonDrogon> it's been a while since I've done a recursive delete from / though..
[13:02] <gordonDrogon> I have some pure ramdisk system that's fun to play those sorts of tricks with. [13:03] <Lobs> wny not just make a virtual machine inside a 512 pi of a 256 one? [13:03] <Lobs> 2 for the price of 1! [13:05] <soltys> can anyone tell me how to mount usb disk via lxde file manager with rw access ? [13:05] <soltys> it mounts drive but only for reading..
[13:05] <gordonDrogon> soltys, it is NTFS? [13:06] <gordonDrogon> although that used to be read-only, but I think they were working on R/W ..
[13:06] <gordonDrogon> no idea - I'd try manually - sudo mount /dev/sda1 /mnt and see what happens. [13:09] <Lobs> soltys: with it mounted, does `sudo touch /mnt/poop` make a poop? [13:11] <frikinz> mmhh fsck needed? [13:12] <Lobs> nothing funky in dmesg? [13:15] <gordonDrogon> it's possible that the root of the drive is not read/write permissions for your user. [13:15] <gordonDrogon> cd /mnt ; ls -ld . [13:17] <Lobs> the fact it still gave a permission denied does not seem good. [13:18] <Lobs> soltys: so when i gave you that command before you decided you knew better and didnt use it as i typed it?!? [13:20] <gordonDrogon> soltys, it's permissions then - do the ls -ld thing then, or be lazy and chmod 1777 . [13:20] <Lobs> soltys: if using sudo allows it to write, then it is a permissions issue, which is why i got you to use sudo, so i could see if root worked, which means you either need to change permissions on the drive or directory's you wish to use. [13:20] <Lobs> gordonDrogon: may i ask why your wife goes on holiday without you? [13:21] <Lobs> soltys: when i gave you that command it was to diagnose a problem, so giving the correct answer from it would have been helpful. [13:24] <soltys> Lobs: I didn;t saw sudo in your command, my bad. [13:24] <frikinz> what has redsleed compared to others? [13:25] <soltys> gordonDrogon: that ls -ld shows drwxr-xr-x 3 root root 4096 gru 29 13:17 . [13:26] <soltys> on my gentoo box mounting wit udisk works fine for that drivw..
[13:40] <TAFB_ssd> bLiNdRaGe: Can you change the middle number in gparted? changing the before/after doesn't change the size, that's only for moving the partition :) try grabbin the partition edges and dragging them too. [13:44] <TAFB_ssd> are you using raspi-config? [13:46] <TAFB_ssd> |Jeroen|: Arm freq is the MAX freq it'll "scale up to", you can try core_freq_min=750 but dunno if that'll work. [13:47] <|Jeroen|> ah isn't it changed in /proc/cpu ? [13:49] <|Jeroen|> what do you do with your pi ? [13:50] <TAFB_ssd> I tried to use it as my main web/email server, but it was too slow (i/o performance on it was terrible, even with super fast SSD drive), so I replaced my Pi with that little black box you see in the pic. [13:50] <TAFB_ssd> called a Sheeva Plug computer. [13:52] <TAFB_ssd> |Jeroen|: usually that's due to crappy MicroUSB cable not providing enough power. check your TP1-TP2 voltage if you've got a multimeter handy. [13:53] <TAFB_ssd> how do you power it? [13:53] <TAFB_ssd> what's your tp1-tp2 voltage? [13:57] <TAFB_ssd> quite low for over clocking, need 4.85 or higher. [13:57] <TAFB_ssd> you might need to brigde your F3 polyfuse, just solder a wire from one side of it to the other. did it on my Pi, flawless after that. [14:00] <|Jeroen|> mhzz, its it safe? [14:01] <TAFB_ssd> super safe, your F3 poly fuse is freakin out. everyone bypasses it. works sweet. [14:02] <Phrewfuf> TAFB_ssd: the main fuse is buggy? [14:03] <Phrewfuf> in what cases? [14:03] <TAFB_ssd> that's why the rPi wiki specifically tells you how to test it. [14:03] <Pitel> Is there some minimal distro which will fit to 128 MB SD card? [14:04] <TAFB_ssd> Pitel: check out berry boot, they have a 5mb OS! [14:04] <Phrewfuf> TAFB_ssd: i assume tp1-tp2 should be 5v, is that right? [14:04] <TAFB_ssd> you can run your boot off 128mb SD and run your OS off USB (that's what i do). [14:04] <TAFB_ssd> Phrewfuf: Anything over 4.85 is great, 4.9 is awesome. [14:07] <TAFB_ssd> Phrewfuf: the regulators they use are absolute garbage, that's why the Pi draws so much current and is so picky!! [14:07] <TAFB_ssd> if they use switching regulator instead of linear regulator for RG2 = no heat and way less current and way better tolerance! [14:07] <Phrewfuf> wasn't there a blogpost about replacing that darn linear regulators with switched PSUs? [14:08] <Phrewfuf> do you have a link on hand? [14:09] <TAFB_ssd> nope :( my friend who's big into modding flashlights did it for me. I'll ask him for the info for ya :) if you google 5v to 3.3v buck regulator or switching regulator you could probably find it. [14:12] <TAFB_ssd> no probs, some boxes can't do 1ghz, if you got samsung ram, etc. [14:13] <|Jeroen|> shoould i also drop ram feq? [14:14] <TAFB_ssd> |Jeroen|: leave it the same for now, test. [14:14] <TAFB_ssd> Hoerie: Who knows :) my first two Pi's were undercooked from the factory. I got mine replaced, my friend put them in his oven. lol. [14:15] <TAFB_ssd> This was a regular oven, but the re-flow worked flawless, pi is still rockin to this dar. [14:16] <TAFB_ssd> did it on metal baking sheet, on tinfoil, upside down for 500f a little over 2 mins. as soon as the audio jack started to melt we starting cooling ramp. [14:28] <Phrewfuf> btw TAFB_ssd do you have any experience with xbmc on raspbian? [14:33] <Phrewfuf> did you do anything with mpd? [14:41] <TechDesk> archlinux isen't supported on odroid-x2 ? [14:43] <FunkyELF> E: Unable to correct problems, you have held broken packages. [14:44] <viric> release the broken packages! Freedom for the broken packages! [14:50] <TechDesk> archlinux is really not supported on odroid-x2 ? [15:02] <FunkyELF> so I can't install xbmc on rasbpian? [15:12] <mdszy> hooray, got Arch Linux ARM to work. [15:28] <techkid6> How do I check how much space is left on my SD card? [15:29] <Phrewfuf> doesn't fdisk -l also show usage? [15:35] <techkid6> I used more than I have? [15:59] <pmagi> Hi, anyone got an idea how to execute a bash script on boot/reboot? [16:07] <martk100> Is it possible to open desktop icons with single click? [16:08] <martk100> techkid6: You could use fuse2fs or do it from raspi-config. [16:24] <gko> Just bought a RaspberryPi. 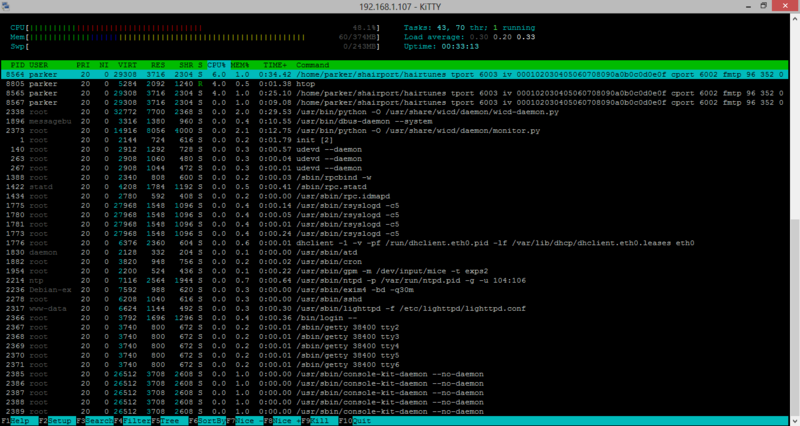 Awesome... How is archlinux-hf-2012-09-18.img, compared to 2012-12-16-wheezy-raspbian.img? 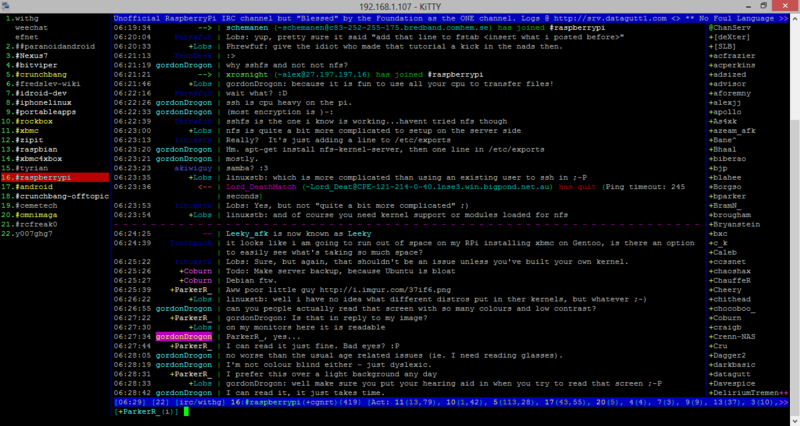 [16:25] <gko> 2012-12-16-wheezy-raspbian.img comes with Emacs 23... Can I compile 24.2 with it? [16:39] <rymate1234> gko, can you compile emacs on a normal PC? [16:42] <gko> Not expecting it to be. [16:50] <xrosnight> LANG = "en_GB.UTF-8"
[16:50] <xrosnight> are supported and installed on your system. [17:02] <h3sp4wn> Samba4 BDC (Or PDC to start) anyone created one from a pi yet ? [17:09] <h3sp4wn> xrosnight: What do you need to know about locales ? [17:13] <xrosnight> are they wrong ? [17:16] <martk100> Can I set my desktop icons to open with single click? I use Debian Wheezy. [17:19] <xrosnight> okay let me try. but export only works in one shell once right? [17:20] <pmagi> I'm gonna head out in a couple of minutes to test it, gonna shoot 2" mortarshells. [17:21] <xrosnight> export LANGUAGE= "en_GB.UTF-8"
[17:23] <xrosnight> damn . it works now. [17:23] <xrosnight> all are because of my space! [17:26] <xrosnight> h3sp4wn: should LANGUAGE=en_GB:en or just en_GB.UTF-8 ? [17:27] <xrosnight> h3sp4wn: okay. then i will need locale-gen , right? [17:29] <Phrewfuf> rymate1234: do you happen to have a voltmeter on hand? [17:32] <xrosnight> Phrewfuf: once i over-clocked Pi up to 900Mhz, it stopped when booting :( why is that , should it need power more than 5 V ? [17:34] <Phrewfuf> and if you draw too much current, what happes to your voltage? [17:35] <xrosnight> Phrewfuf: you mean like 7 V ? [17:39] <h3sp4wn> Phrewfuf: I am not sure if we are talking about the same thing but so you are saying if I have a PSU that can do 2A at 5V then the pi won't handle that properly ? [18:15] * FrankBlues waves from his brand new pi! [18:22] <atouk> firing system? the boss said FILING system. Now we're ALL getting pink slipped! [18:22] <|Jeroen|> what does if fire ? [18:25] <FrankBlues> Still uploading / processing maybe? [18:26] <pmagi> Perhaps it hasn't been provisioned to their cdn yet. [18:27] <Phrewfuf> it just starts to load, says its 43s long and then "currently unavailable"
[18:28] <Hopsy> |Jeroen|: jeroen, help! [18:29] <FrankBlues> Phrewfuf: Permissions with something in /dev maybe? [18:30] <Phrewfuf> it said "add your user to the group input"
[18:31] <|Jeroen|> is that also beer ? [18:31] <Hopsy> a good one! [18:34] <FrankBlues> Phrewfuf, http://www.raspberrypi.org/phpBB3/viewtopic.php?p=138648 - fourth post down gives a hack that should work. [18:45] <Phrewfuf> FrankBlues: awesome, thanks! [18:46] <FrankBlues> Hope it works! [18:47] <Phrewfuf> btw, is it possible to hide the console output during boot behind some nice logo or something? [18:49] <FrankBlues> I know the Fedora distro has a rotating raspberry pi logo as it boots, not sure how they do that. [18:49] <PhotoJim> Phrewfuf: probably, but far more informative to see the boot info in case you have a problem. [18:49] <TomWij> FrankBlues: Create a h264 video and play it back. [18:51] <FrankBlues> Nice little script, maybe? [18:53] <FrankBlues> Although that means it would all run if you change initlevels too, iirc. [18:53] <Phrewfuf> "executed at the end of each multiuser runlevel"
[18:56] <FrankBlues> Not sure... I haven't had to change runlevels in a long time, and when I have it was usually to go down to single-user. [18:57] <FrankBlues> Used to be that RedHat (pre-fedora) used runlevels to bring X up and down, as well as NFS, not sure if that's still the case. [19:00] <FrankBlues> I still expect some sort of grindy disk noise when I'm overloading the thing to tell me I need to wait and chill out. [19:08] <h3sp4wn> Has anyone tried the Atrix HD Dock yet (I know people use the Atrix lapdock) it has a remote with it. (Never even used it but was cheaper to get the kit than the bt keyboard and mouse seperate). [19:42] <techkid6> Is there a way to stream to a shoutcast station from a pi? [19:45] <|Jeroen|> isn't that the same ? [19:51] <FrankBlues> Is there a way to tell what the processor speed is currently? [19:56] <intothev01d> are you both running xbmc on raspbian or raspbmc? 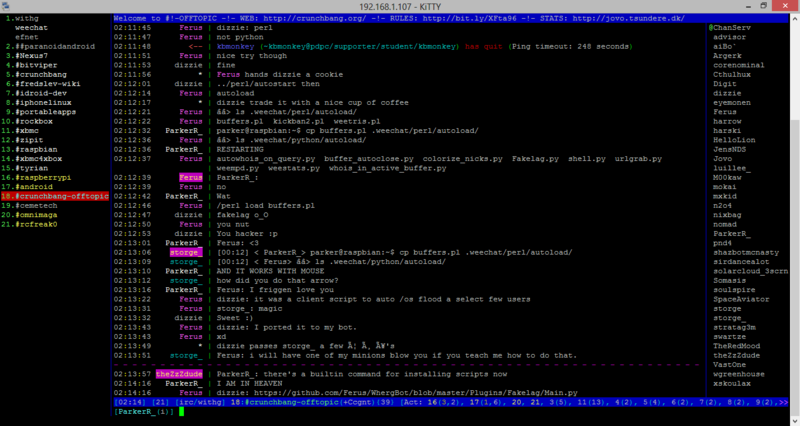 [19:57] <intothev01d> can you see your terminal behind xbmc? [19:59] <intothev01d> no idea about xbmc on raspbian? [20:08] <Toothpick> Phrewfuf: do you use cec? [20:09] <Phrewfuf> why d' you ask? [20:10] <|Jeroen|> wel isn"t geexbox xmbc there days ? [20:10] <sraue> why users want use xbmc only but complain about "limited features"? and whats limited in openelec ? [20:11] <pioj_> what's your choice then guys? Raspbmc? [20:11] <h3sp4wn> I dunno whether geexbox is based on buildroot or not. (I know for a fact if its openembedded I won't be using it). [20:13] <|Jeroen|> does geexbox support the PI ? [20:18] <FrankBlues> Is mythtv ported to the pi? 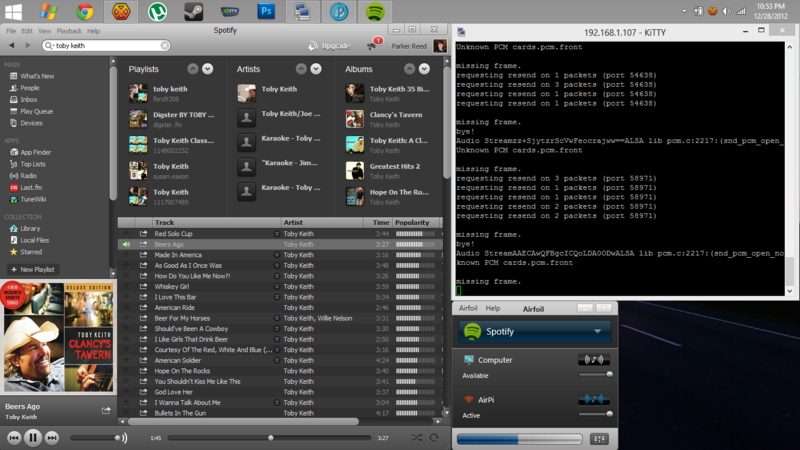 [20:19] <FrankBlues> Backend might run well on pi, not sure about the frontend. [20:19] <pioj_> what about that xul player? [20:21] <FrankBlues> But the backend is just taking a MPEG stream over the air and recording it as an MPEG stream on the disk, no? [20:30] <pioj_> btw, Are you guys using Pi to play games? [20:35] <pioj_> what about emulators? [20:36] <frikinz> What's your best uptime on the raspberry pi? [20:37] <Phrewfuf> |Jeroen|: i heard someone saying the GPU won't need more than 128, did you monitor usage? [20:38] <|Jeroen|> how can u watch video ram? [20:40] <pioj_> that's why I'm asking about it..
[20:45] <Kisume> Oh god it arrived! [20:48] <Kisume> No, these are still there. [20:48] <Kisume> Ordered from RS? [20:49] <Kisume> I am absolutely clueless to why RS uses paper envelopes. [20:49] <Kisume> Also, mine went through Germany, for some reason. [20:49] <Kisume> Double customs all the way, etc. [20:50] <Kisume> ... That makes sense! [20:50] * Kisume lives in The Netherlands. But I guess German Postalservice is just better. [20:51] <Kisume> "Invalid if broken"... now the question is, what becomes invalid? [20:51] <Kisume> My warranty? The raspberry pi? My sanity? [20:53] <Phrewfuf> what do you wanna do with it? [20:56] <Phrewfuf> is the IO really that bad? [20:56] <Phrewfuf> Torikun: did you write to sdcard? [20:57] <Kisume> Okay so my HDMI cable is still not in the mail... I'm tempted to go for a bad SSH-job. [20:58] <Kisume> I shall SSH! [20:58] <Kisume> If I wouldn't be so chaotic this could be easy. [20:59] <Torikun> can you put up with that speed? [21:00] <gordonDrogon> a quick favour - can anyone see https://projects.drogon.net/ or do you get a blank page? [21:03] <Phrewfuf> yeah, but what to do with 200mbit of data? [21:34] <clear`> anyone created their own power supply for the pi? [21:34] <clear`> instead of the usb wall charger? [21:37] <clear`> didnt think of that! [21:41] <Kisume> RS, I am disappointed. [21:41] <Kisume> 1) Seals broken. 2) Pi didn't fit in case. 3) Paper envelope, what. [21:42] <h3sp4wn> Won't look nice without hacking it to bits. [21:42] <Phrewfuf> Kisume: pi didn't fit in case? [21:42] <Kisume> Couldn't get it in there without risking me breaking the bord. [21:42] <Kisume> The RS clear case. [21:42] <Kisume> Managed to fix it now though. [21:43] <Phrewfuf> wird, werde ich massenweise anticreepercards ausdrucken. [21:46] <clear`> looks like it has everything! [21:48] <clear`> Phrewfuf: you using openelec? [21:54] <netw1z> anyone using bluetooth audio with their rPI? [21:57] <gordonDrogon> amackera, thanks - looks like the w3cache plugin was borked - probably after the update earlier to fix a bug that was published. [22:01] <gordonDrogon> clear`, yes - and I'd applied their update either last night or this morning too. [22:03] <gordonDrogon> I might leave it a revision before re-installing it..
[22:05] <gordonDrogon> when there's a vulnerability, I presume? [22:05] <gordonDrogon> I don't use many at all on my site there- just the theme, wp-spamfree, an enhanved tinymce and the seo one. [22:07] <gordonDrogon> oh the joys of wordpress! [22:11] <confusid> I'm trying to use motion with 2 camera and it runs for a few minutes then it shuts down. [22:12] <confusid> Not sure what is causing it to stop. Using a 3.5A usb hub so it has plenty of power. Web Cams use 500ma each. No other usb items plugged in. [22:32] <ParkerR_> frxstrem: What are you using to SSH in? [22:32] <confusid> I'm not sure I understand the question. [22:32] <ParkerR_> Another linux box? Windows? Mac? [22:38] <frxstrem> on the pi? [22:46] <Neqoxec> when I play audio over hdmi, I get sound for a split second before it cuts out with no errors. Not really sure where to start, should I toy around with alsa configs? [22:49] <rikkib> I use multiple methods to keep bad people out... And there they stay forever. [22:50] <rikkib> I did run into a user here that was blocked recently... Otherwise it is not likely I will ever know of care. [22:52] <rikkib> I actively monitor traffic, tcpdump runs all the time on this gateway, and take action to block... As well as port sentry triggers wich auto add to hosts.deny. [23:57] <gluxon> Is backfeeding power supplies good or bad? [23:57] <gluxon> Or does it depend on scenario? [23:58] <gluxon> I realize what backfeeding is, just not the effects of it. [23:58] <Kisume> I'm still unsure if I should mail RS about these broken seals or if I shouldn't.